If you understand organisations then you are more powerful, in that you are then able to further your own interests and/or those of the organisation. It then makes sense that all engineers as part of their undergraduate degrees, or their subsequent professional development, have to study organisational behaviour as part of their management training. This is a major requirement of Engineering Council UK (ECUK) for those wishing to become chartered engineers. 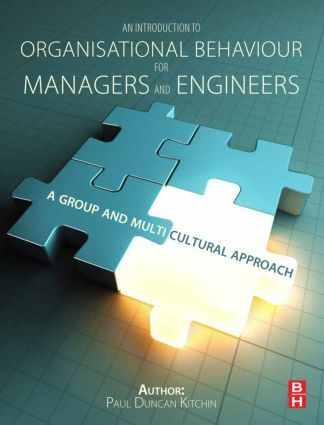 This book aims to support courses that go towards meeting the ECUK requirements for management and business training, with coverage of team and group working, and further discussion of international cultural difference, which are major features of engineering degrees today. Chapters also cover key issues for maintaining a healthy working environment within an organisation, such as motivating employees, managing stress and dealing with organisational politics, as well as subjects to provide a greater understanding of company management including leadership and organizational structures. An Introduction to Organisational Behaviour for Managers and Engineers provides not only a practical introduction to OB for management students, but also a text that is specifically aimed at the needs of engineers and students of engineering.